This month I was featured on a couple of sites! And I wanted to share them with you. I also had an interview with girlscene.nl! Which will be published sometime late August! I'm very excited for that! And I'm going to Chersonissos the day after tomorrow!! That's gonna be lots of fun. So I won't be able to update my blog for about a week. It's rainy weather all over again, I miss the sun already. But happily I'm going to Chersonissos upcoming Thursday!! I'm really excited about that, that's just what I need on the moment. 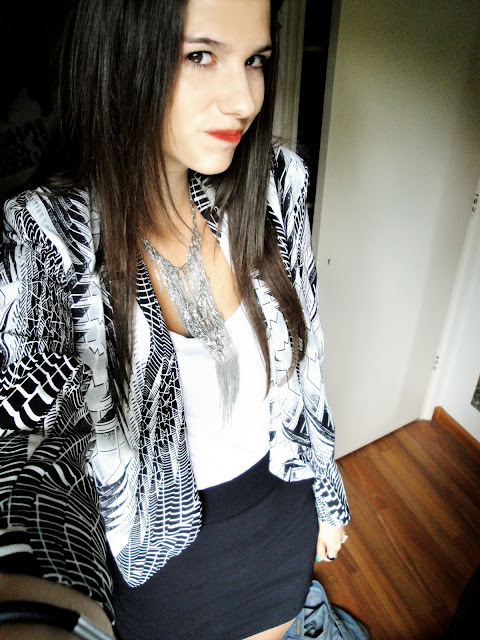 Today I wear my new blazer from the H&M and this new Necklace also bought there. I really like the fabric and the print of this blazer. Hope you like it :)! I think that a must-have for this time of the year is the over-sized white blouse. I had already seen it on many blogs, and I just had to have one myself. On my shopping spree in Amsterdam this white blouse directly caught my eye, and it only costed me €9,95 !! Yess. 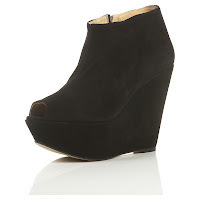 On the pictures I'm also wearing my new wedges I bought on Ebay a while a go! They look exactly the same as the one I saw on the webshop of Tophsop (see picture), but they are muchhh cheaper (about €25 euro). So that's another yess! Another outfit post. I'm really wearing this skirt a lot, but I really really like it. Besides that, I feel miserable :(, just got dumped by my boyfriend. And he cheated on me on vacation :( :(. Any tips how I can get over a boy??? I'm going crazy, and I have simply no clue how to get over him on the moment.. Help Help. It was all sunny weather all over again. So I took a good look in my closet and found this cute skirt that I haven't really wore at all! Bought it as a dress by Zara, but it broke down soon :( So now I'm forced to wear it as a skirt, but I like the result :)! What do you think? A few weeks a go, my brother got married (first picture: the newly weds)!! It took a while before I got the pictures (they went on their honeymoon). But finally I got them. On the day I wore this lovely red dress of the H&M garden collection. It was the perfect romantic dress for a wedding. Wore it with some high heels from Pieces. It was a great day! Quick look of the day update, cause i'm really really tired. Spend my whole day shopping in Amsterdam today! Bought some really really nice pieces which I definitely will show you soon! This is what a wore a few days a go, really like the denim trend this season, can't get enough of it! Sale. Maybe my favorite time of the year. Especially sale in summer. But thats just because i love summer. Bought this trousers by Zara with a 50% discount, and I'm really happy with it. Really love the color of it. The tee I also bought recently, just a simple shirt that everyone should own. I've already shown you this look, but with really bad pictures. So here's my lovely chiffon skirt ones again, with better pictures! Hope you like it! Have a sunny day fellow bloggers! But to keep you guys updated, this is what I wore yesterday. I finally received my chiffon skirt from Queens Wardrobe, and I totally love it. Besides that, I bought this really pretty bag from Zara yesterday (pic 2)! I also received the Snow Ring from Queens Wardrobe (picture 3). Really like the (to) big rings! What do you think about the whole look?? Next time I promise it will be decent pictures again!